A flat tire can happen at any time in any weather. The time to prepare for an emergency is before it occurs. 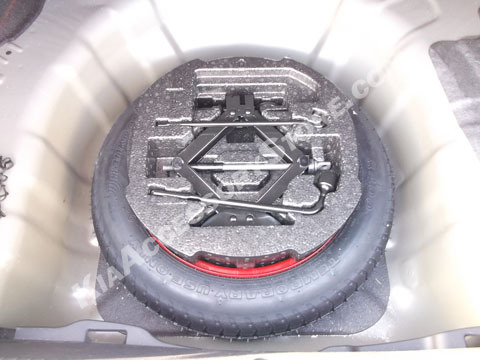 This a Kia OEM designed compact spare (doughnut) tire kit1. Professionally mounted 2 by an ASE Certified Technician. This kit will fit all 2014 Kia Souls regardless of wheel size. Approximate weight of this kit is 35lbs 4. This spare tire may set off your TPMS and/or ESC system. There is no sensor in the wheel for the TPMS system. The ESC system may not work as designed due to the difference in tire size. We recommend turning your ESC system off (if possible) while using the spare. 1. Not to be used as a replacement wheel. Wheel is intended to be used for emergencies only. 2. Tire does not come pre-inflated. Set pressure before installing. It is recommended to check pressure at every tire rotation. 3. Tire may be substituted for another name brand based on availability. 4. Added weight of this kit may affect EPA stated gas mileage claims. They handled my order quickly. The spare comes with everything you need, the included tools are nicely held i the styrofoam insert. It even included a replacement tire pressure sticker to put on the driver side door jam.